The November election includes 13 Florida constitutional amendments. Here’s what they all mean. When you head to the ballot box in November, you’ll vote on 13 statewide constitutional amendments along with candidates seeking seats in the U.S. Senate and House, state House and Senate and the state executive branch, among others. The number of ballot amendments is the most since 1998 and propose measures like betting on dog racing, prior felon suffrage, school board term limits and vaping indoors. 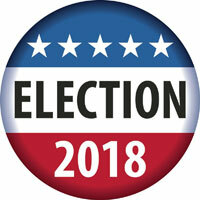 Amendments need 60-percent approval from voters to be green-lighted. Here are the 13 proposed statewide amendments and what they mean. What it means: Would increase the portion of a home’s value that’s exempted from non-school property taxes. The changes would apply to the value of a home between $100,000 and $125,000 with the maximum exemption climbing to $75,000. What it means: Would limit increases to assessment rates to 10-percent per year. Secures an existing cap on non-homestead property assessments. What it means: Would provide voters with the “exclusive right to decide whether to authorize casino gambling” and expansions in the state. Both the state legislature and the voters currently have the authority to authorize casino gambling through constitutional amendment. What it means: Would restore the right to vote for more people with prior felony convictions upon completion of their sentences. It would exclude those convicted of murder and felony sexual offenses. What it means: Would increase the majority needed in the state Legislature to two-thirds to impose, approve or raise taxes. It would also mean it would take only a third of members in either the House or Senate to block tax increases or repeal exemptions. What it means: Would add a list of rights for crime victims, known as a Marsy’s Law. The other two aspects of this measure would increase the retirement age for judges to 75 and would prohibit judges from deferring to administrative agencies’ interpretations of a law when ruling in cases. What it means: Would require employers to provide benefits to surviving spouses of first responders if they die on duty, and it would require the state to provide benefits to surviving spouses of active-duty military members who are killed. The last parts of the measure would require university trustees to agree by a third-thirds super-majority to raise college fees and establish the state college system in the state Constitution. Universities are currently in the Constitution, but state colleges (community colleges) are not. What it means: Creates a consecutive eight-year term limit for school board members, allows state governments to control public schools not established by the school board and requires the Legislature to promote civic literacy in public education. What it means: It would ban offshore drilling for oil and natural gas on all lands beneath state waters. The measure also bans the use of vapor-generating electronic devices, including electronic cigarettes, in indoor workplaces. What it means: Would add a state Department of Veterans Affairs and create a state office of Domestic Security and Counter-terrorism. The measure would also require the Legislature session to start in January rather than March in even-numbered years. Lastly, the measure includes a proposal that would require five county-level offices to be elected statewide: sheriffs, tax collectors, property appraisers, supervisors of elections and clerks of circuit court. Many counties already elect these positions. What it means: Would do away with the prohibition against foreign-born persons from owning, inheriting, disposing or possessing property. The measure removes a provision that stated a high-speed rail system be developed in Florida and revises a provision on criminal prosecution so that it’s clear that repealing a criminal statute does not retroactively affect the prosecution of a previously-committed crime. What it means: Expands restrictions on lobbying for compensation by former public officers, creates restrictions on lobbying by current public officers and prohibits certain abuse of public office for personal benefit. What it means: The measure would prohibit the racing of and betting on greyhounds and other dogs after a specified date.